Columbine is a group of 22 native species, European native and innumerable hybrids. The plant’s Latin genus name, Aquilegia, is derived from the flower’s five long sepals, which resemble eagle talons. Many species of native columbine are hybrids of other wild columbine species and are extremely isolated, especially where they occur in desert areas. Red columbine (Aquilegia canadensis) is the most widespread native species; hybrid varieties are available in every imaginable color and size. The leaves of the columbine give it away as a member of the buttercup family (Ranunculaceae): Leaves are narrow at the base, flaring outward towards flat, scalloped edges. Many species have a characteristic blue-green leaf color. The unique inverted flowers appear in early to mid-spring; the long tubes of the sepals extend upward beyond the base of the flower. Plants form loose clumps, growing to from 12 to 30 inches tall. Columbine reseeds freely, but individual plants are relatively short-lived, usually lasting only three or four years. In the wild, columbine typically grows in sunny to partly shaded settings in well-drained soil, though it tolerates a fairly wide range of soil and sun conditions. Colonies have been known to grow in full sun on hills and cliffs, but the usual setting is along woodland or meadow borders and near stream banks. Pinch back flowers after flowering to encourage re-blooming, or allow plants to form seed-pods to reproduce. Columbine is an excellent choice for bird lovers, as hummingbirds are drawn to the flowers of any variety and other birds seek out the columbine’s seed pods for food in the fall. The unusual foliage color makes it an interesting addition to the perennial or woodland garden, and once flowers have faded the fern-like habit of the plant retains its general interest. As a buttercup relative, columbine is also more deer-resistant than other types of garden perennials. 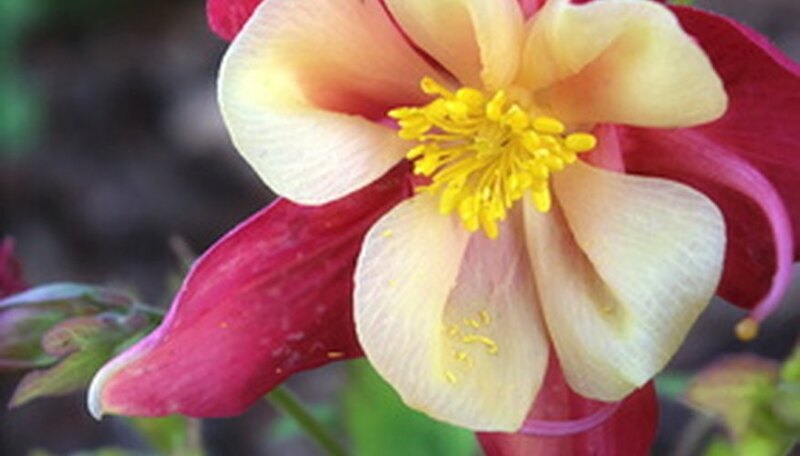 Most types of hybrid columbines are crosses of European and western strains that are distinguished by their larger size and upward-facing flowers. Hybrid flowers are frequently bicolored; that is, the inner petals are a different but related hue from the outer sepals. The largest group of hybrids belong to the so-called McKana Group, occurring as white, red, yellow, blue, pink, purple and maroon-flowered forms. Hybrids prefer a bit more shade than their native cousins. Wild species of columbine are generally easy to grow and relatively pest-free, though leaf miners may attack in the summer. Leaf miner damage is strictly cosmetic and the white, looping trails the larvae leave in the foliage will not injure the plant. Hybrid columbine varieties are especially susceptible leaf miner damage, as well as attacks by stem borers, caterpillars and aphids. Cutting back damaged foliage is recommended for especially bad infestations. Hybrids are also subject to several diseases, such as powdery mildew, rust, leaf spot and blight.